Many people think that taking your hair to blonde from brown is very easy. Sometimes this is easy, other times, not at all. Here at Grace Kelly Salon we make sure we properly asses the hair and what all it has been through so we can ensure your hair stays as healthy as possible. Some things that need to be taken into consideration if you’re deciding to go blonde would be the condition of your hair. Are you one that constantly goes from blonde to dark, to blonde again? If this is the case extra care needs to be taken in order to keep your hair healthy. Another thing to keep in mind is what type of color has been used. Do you get your hair professionally colored at the salon, or do you do your hair at home with box color, applying it from root to ends every time? Do you apply excess heat with no protection on a daily basis? These are all factors that we consider and talk about with our clients before we start the blonding process. After a proper, and thorough consultation has been done to determine what type of blonde the client wants, we can start the lightening process. 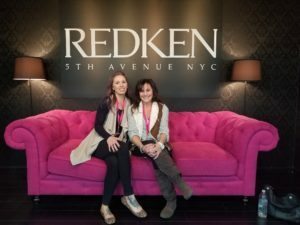 In order to ensure proper healthy hair, we put Redken’s PH Bonder into our lightener. As the hair lightens it goes through a chemical process where our disulfide bonds can break. When too many of these bonds break, we get damaged, brittle hair that snaps off. What Redken’s PH bonder does is make sure that those bonds do not break, meaning healthier hair! As the hair goes through the lightening process we make sure to watch it closely and make sure it’s not left on for too long. Once the desired, and appropriate lift is safely achieved we can rinse the lightener. Before we shampoo though, we make sure to use step 2 of the PH bonder. After shampooing the hair we make sure to apply CAT. CAT helps even out the porosity of the hair and strengthen any weak spots. This is also something great to use right before we tone the hair because it ensures we have an even canvas to work with. We use Redken’s Shade EQ to tone the hair. Shades EQ is an ammonia free, conditioning color that gives added shine to the hair. Once we are finished toning the hair to the look desired (whether that be ashy, silvery, or caramel) we make sure to properly condition the hair. One of our favorite shampoo and conditioner to use with blondes would be Redken Extreme which gives added protein to the hair. It helps repair weak, damaged hair. We always recommend a healthy trim for those fresh blonde locks. Leaving split ends alone will cause the split to travel up the hair shaft which is where we get broken pieces. We make sure to properly educate our clients on the proper aftercare that they should keep up with on their end to keep their blonde looking the best it can be. Sometimes the desired lift can’t be achieved in one appointment safely. During the consultation we make sure to explain this to our clients. If this is the case, we recommend giving your hair a rest for a few weeks from heat, and chemicals and make sure to use the recommend conditioning treatments that your stylist suggested for you.